X-Rite's "Test Your Color IQ." I almost aced this, leaving room for you to beat my score. Not much room, but room. See how you do. As Colin says, it's not much fun, but it's revealing. I'll post my score tomorrow, after you've had a chance to take the test yourself if you're so inclined. If you didn't score as well as many of those who left comments, note that voluntary reporting of performance-based tests will skew toward those who did well...the colloquial term is "bragging. "People reporting scores in double digits probably would score well on a test for something called "honesty." Both Ctein and I noticed on this test that there are slight luminance variations between some of the tiles, which can tend to throw you off. I'm more sensitive to luminance than I am to chroma. I was aware of my uncertainty in the region in which I showed error. I'm going to close the comments soon because we're getting too many, and it's a chore for me to approve and post large numbers of comments. The best part was when my wife walked into the room, saw what I was doing, and said, "you're such a geek." Challenging - I bet monitor quality has a bearing on it! I was very curious to try this as I've known since I was about 19 years old that I was to some degree red/green "color blind." It does not seem to have affected my life much but it might explain why I am partial to black & white photographs more than color photographs. Would be interesting if they gave an average score for the demographic. I'm curious if I would have done better with a - an S-IPS rather than a S-PVA based monitor, b - any other light on in the room other than the 40w equivalent "natural" fluorescent or c - less beer. Very much to my amazement, scored a perfect "0". What I can't understand now is how I manage to leave the house in the morning wearing one blue sock and one black one. 20-29 range, damn and blast... of course I am on a laptop, I'm in a super rush, I'm beat, and its 1 in the morning; so that'll be my excuse for now. Whew. I wish to thank members of the Apple Cinema Display Academy, the Spyder2 Pro, all my commercial customers out there who have demanded the best in color correction from me over the years, and of course my mom and dad. I stand on their genetic shoulders. I will treasure this perfect score as long as I can remember it, which in my age group (50-59) will be one or two weeks. I got a perfect score as well for the 20-29 range...non calibrated Dell XPS m1330. I think the secret is to stand back and try to look at it as a smooth gradation and pick out the ones that don't seem right. Interestingly enough there are about four of the greenish blocks in the second row that I couldn't quite decide on in the Aston Martin green section, and sure enough those were the ones I seem to have missed. 7, and I'm quite unhappy with my current monitor. When I was an ophthalmology resident I learned about the Farnsworth-Munsell Hue Discrimination Test, but never actually sat down to take it. Another 4, in the 30-39 demographic. On a Macbook Pro laptop (calibrated, though). What I find especially interesting is not really the absolute score, but to know where in the hue range I made the mistakes. I often seem to struggle with colour casts in my pictures so I had been thinking that I'm must be colour impaired... but apparently not, because I got a perfect 0! Male, 35yrs, on a 15" MBP that hasn't been calibrated in about three months. Fell down in the earthy terracotta tones. Keen to try again on my old CRT later today. I was pretty sure I'd aced it , until I looked at the score. Not as hard as getting Mike's anti-robot number posting gizmo -- I fail that about once a week. I'm 68 years old and scored a perfect "0" - made my day! Hah! Picture perfect. :-) Zero. Age group 40-49. No matrix - CRT. There is an even harder test, with areas all put together, not in a line. Of course, I have no idea where it is. Not much fun first thing in the morning and only on my second coffee. Perhaps I should try it again in the evening when I do most photo processing. I had to leave it for a few minutes because my brain started playing tricks after staring at it for a few minutes. Mmmm I got a 21 (age range 60-69)Maybe that's why I have always preferred B&W over the last 40 years! 4 with a bad hangover. A weakness in the greens, apparently. Male, 30 - 39. Do I get a prize? I got 7 which amazes my wife who claims that I can't tell brown from olive green. My score was 4. I'll be 47 in January. A paltry 28, from the 40-49 age bracket. I have to give the exact same comment as Bill Corbett, a perfect score yet currently wearing two different coloured socks! Tested on an uncalibrated macbook btw. I got 7 on an uncalibrated Dell laptop screen. I'm 19. I scored a 4. I thought this would be harder than that with a three-year-old consumer LCD screen, which is not calibrated. "We don't need no stinkin tests.."
Scored 11 in my age group (30-39). Male 50 year old (as of last week) and got a 0 as well - a bit stunned to be honest. Maybe there's another career out there for me. Forgot to mention I am 43 years of age. I did this a few weeks ago and scored a 12 I bet if I did this at night with no lights on I would get them all. * On a beat up old CRT that hasn't been calibrated in a long, long while, which I need to replace. To be honest I'm quite relieved by that score, after staring at the those color patches for a while I was beginning to wonder if I've slightly color blind my whole life and never realized it. After getting that score, now I wish I'd spent a little bit more time on the later patches, because there was something in there that was bothering me, but I couldn't quite figure it out right away. I'm red/green colour blind, so I didn't expect to do very well, I wish it would show exactly which tiles were in the wrong places. I scored 4. Non calibrated, violettish old Apple Cinema. I don't know if I should be happy because I got a low score of scared because I got it on a crappy monitor. What does that tell you about my "eyes calibration"? I got a 20, which is disappointing as I was sure I aced the thing. All of my misses were in the blue/green area of the spectrum and clumped into two small groups. In my defense, I am getting old (40-49 age group). I got a 7 in 20-29 age group on a calibrated laptop display. My mistakes were highly clustered. I'm going to try on another screen and see if the pattern repeats. I too will treasure a perfect score in the 50-59 age group. I've always said my old Apple monitor is calibrated within an inch of its life and I guess it is. Perfect score on a Dell M1710 laptop monitor (male 20-29 bracket). I just took my time. I found the last 2 bars trickier than the first two. High score of 1520 so it says, though the bar graph only goes to 99. It would be interesting if they put you into a percentile of respondents. Samsung SyncMaster 920T calibrated with a ColorVision Spyder2 about a month ago. First time I score zero on a test to get told it is perfect. Odd too, since I was pretty sure I got half a dozen squares that I could not manage to place in the right position. Apparently my MacBookPro, for all its fault, has a decent screen (at least for playing home decorator with little colour patches). Nailed it! 30-39 bracket, scored a perfect 0. I scored eight and zero. The first time, scoring eight, I didn't ever attempt to swap two adjacent tiles that already looked okay in their current, default arrangement. The second time, I did and that made a big difference . The result of the first test (8) also point out that my weakness is also in the blue-green area. Luckily scored a "0". Must be those bilateral lens implants a few years ago for cataracts! I'm using a ViewSonic CRT monitor calibrated with a Colorvision Spyder 2. Age: 57. Perhaps I should now go out to buy a more expensive camera to compensate? I am convinced that if I have more megapixels in my camera, I can ace this test. Got a 23 using my Macbook screen (uncalibrated), age 54. I'm in agreement the blue-greens are the hardest. 12. Uncalibrated Fujitsu-Siemens laptop (which I'm now thinking I may need to calibrate). Age 40-49. Actually, I wonder how much effect the monitor calibration has. I admit I thought I'd got them all right, but who didn't when the hit the button? I did this on my laptop and thought it wouldn't work well due to colour calibration issues. 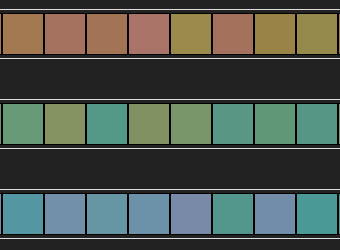 Turns out I didn't have to worry because it tells me "I have perfect colour vision" - got "0". I'm in the 40-49 age range. This surprised me actually. 0, imac lcd monitor, calibrated with colorsync, age 59. If you spend 30 years making custom type C prints, you will have perfect color vision, and be obsolete. I also got a 4, with my problem area also being the blue-greens. Using a calibrated Samsung SyncMaster 226CW. Age 26. Scored 16. As a somewhat color-blind 61 year-old male, I'm more than pleased. I noticed some of the middle hues in the top row shifting from red to green, but by concentrating I got them under control. Did the same thing during many years of professional color printing. Ended up missing some of the blue-greens. Male, 30. Philips 200WP7 MVA panel. Eye-calibrated. Looks like not all patches had the same luminosity, making things a little more difficult. "Hey, I printed my score off - no cheating here mister! :))"
I didn't mean that anyone was cheating--I merely meant that people who report on their own performance even when that performance is poor probably have a predisposition to honesty. The more self-regarding thing to do in such a case (although also not lying, certainly) is simply not to report. I also got a zero, age 29. I did have to stop for a moment, though, since the stripes started to do the "burning in" thing to my eyes that's so popular for optical illusions. Oh, and I'm currently in the office on an uncalibrated 20" imac under fluorescent light. I don't think calibration actually has much of an influence here unless the monitor has a very dramatic colour shift (or unless you were doing the left half of the stripes on one and the right half on another monitor) since any colour cast would influence all the tiles the same way and just shift everything the same amount – or am I thinking wrong here? I don't belive it, but... I DID mastered this test. My score iz 0. On the LCD screen. Scored an 8 in the 60-69 group. Did the test, clicked on the result, found a result of 3 and the white bars at the bottom put me in the middle of my age range, I thought. ( 60, male) With no indication of whether 3 was high or low, I thought, "oh well , average -that's OK for me", then saw the others' results, and felt a lot better!!!! Went out and photographed my nashi tree in full blossom in this Australian spring!!! Life is good! MacBook Pro, eye-balled the calibration. Now if I could just use my new found super-power for evil. This one goes to 11, in the 20-29 range. Best 0, worst 1520. I guess I'm not THAT bad. How much do you think a good quality and well calibrated monitor would affect the scoring? As much as I'd like to blame it on the display, I wonder if calibration and color accuracy really affect the outcome of this test. It seems like as long as the colors are accurate relative to each other, that it doesn't really matter if they match some predefined standard. Anyone know for sure? Woohoo. Got my zero. 46y male. As a test I had my 19 year old daughter who has just had four years of highschool art. Beat her! I got a 0 as well, and the only evil I can see coming from this is that I have no excuse for missing on the colors anymore. I'm 56 and scored 0. Makes me feel slightly better about myself while wearing 2.5 diopter glasses and watching annoying floaters any time I look at a white wall or blue sky. I dared my teenage kids to match me! calibrated 20" LCD monitor - score 4. We've got Brett and now we're sending up the Giants next week to get you. How's that score? Score of 7. Age 50. Crappy Dell laptop monitor. I did it really quickly and got a 2 then I tried to get a 0 by taking longer and being very careful and got a 28 then I tried again and got a 4 then I went really fast and got a 0. What does that mean? Perfect score. 0. Flip the luminance errors back and forth to overcome them. I thought it was a trick when I was doing it. 44 — at age 60 male — an eye opener and a treat! Perfect zero for me in the 50-59 bracket! I was quite surprised as for some reason I thought wearing glasses from the age of 12 affected my vision! My wife as also surprised as we have many arguments on colours. Got a 4. 40-49. Dell XPS M1530 notebook display. I'm quite surprised. Scored a 4, 50-59 male. Monitor is an Apple Cinema 23" calibrated. An interresting observation here is that a lot of people got good score on uncalibrated screens, me included. Perhaps calibration isn't that important? I thought it was my civil duty to report my score. Just because I'm, ahem, honest, modest, and have frickin' PERFECT COLOUR VISION! I would like to point out that in the 3rd and 4th rows I found some squares that didn't seem to fit, according to my eyes, and the only reason I put them in the correct position is through elimination: everything else seemed in the correct place, so those had to go where I put them. I was surprised to get a perfect score when there where some squares that didn't "look right" to me. Wow -- you did really well. The best I could do was 15. I photograph art, so i was a bit scared to take the test ... my ego needed a good score! 23 in the uppermost end of the 30-39 category. I'm 32 and this was on a uncalibrated DELL 1800FP at work. It would be nice if the distribution of results was shown - I suspect that the upper end of my demographic (M36 - max score 1464, but 99 is considered 'high') is caused by a rogue 'Submit' without completing the test (or without scripting enabled? ).